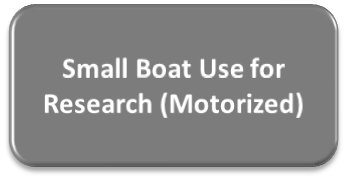 The OSU Small Boat Safety Program works with OSU faculty, staff, students, and approved volunteers using small motorized or non-motorized boats as part of their field research, providing the support needed to operate safely in their research environments. 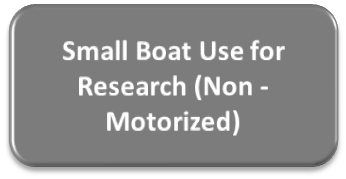 A non-inclusive list of small vessel types operated for OSU research include: small motorboats, personal watercraft (PWC), sailboats, kayaks, drift/row boats, canoes and various types of rafts. Individuals involved in small boat or float craft use for research should contact the DSO directly and complete an Application for OSU Scientific Boating Certification and OSU Vessel Information Form for submission to the DSO. Motorized or non-motorized activities on the water in a small craft carry inherent risks. The inherent risk associated with basic operations then becomes compounded by the complexities and task-loading associated with field research. All the inherent and project-specific risks must be identified and successfully mitigated to a level allowing for safe operations prior to setting out on the water. Personal Floatation Devices (PFDs) - OSU personnel using small motorized or non-motorized vessels for research shall wear an appropriate PFD at all times on the water. Individual and group safety should be the first priority of OSU personnel engaged in field research. The OSU Field Safety Planning Record and information available through OSU Environmental Health and Safety are helpful tools to use when first planning field work, and courses such as Wilderness First Aid and Wilderness First Aid-Afloat are regularly offered through the OSU Adventure Leadership Institute. Any university employee or person(s) utilizing small boats or float craft for research activities under the auspices of OSU must meet OSU standards and policies and have their research float plans approved by the OSU DSO or designee. The OSU small boat program is currently under development. Researchers whose work includes small boat or float craft operations should contact the Diving Safety Officer directly.